Contradicting the Trump administration’s bogus denial that climate change is underway, the Pentagon reported in late January that extreme weather events brought on by rising global temperatures is affecting half of the 3,500 US military sites around the world with floods, droughts, and wildfires. It found that almost 800 US bases were affected by drought, 350 by extreme heat, 225 by flooding during storm surges, and over 200 by wildfires. The US military has long understood that climate change is a threat to US security. A 2014 Pentagon report declared climate change to be a “threat multiplier” that can create terrorists. Newsweek and Reuters reported October 10 that year on a Pentagon report that declared climate change the sort of global threat that can foster terrorism. The Reuters analysis said, “The Department of Defense has dramatically shifted its views towards climate change, and has already begun to treat the phenomenon as a significant threat to national security. Climate change, the Pentagon writes, requires immediate action on the part of the US military.” Ignoring these facts, Trump’s December 2017 “National Security Strategy” and his January 2018 “National Defense Strategy” both avoided any mention of climate change at all. In a slap at this obfuscation, the new Pentagon report warns that climate change is “impacting stability in areas of the world where our troops are operating today.” And notes for example that severe drought exacerbated the Syrian civil war. On February 18, a senior Chinese diplomat reaffirmed that China is will not use nuclear weapons first in a war, reminding a major conference of international military officials that, “China maintains a very small nuclear arsenal (a total of 260 nuclear weapons) and China follows the policy of self-defense and minimum deterrence.” The phrase “minimum deterrence” refers to the policy of deterring a nuclear attack by threatening to retaliate. The United States and Russia each maintain about 7,000 nuclear weapons most of which are designed to strike first and attack enemy nuclear weapons before they are launched. In addition to its formal no-first-use policy, the veteran diplomat Fu Ying, who is also chair of the Foreign Affairs Committee of the National People’s Congress, China’s top legislature, added that under no circumstances will China use or threaten to use nuclear weapons against non-nuclear-weapon states or nuclear-weapon-free zones. She spoke at what was called the Munich Security Conference. Countries that have pledged “no first use” of nuclear weapons include China since 1964, India since 1998, and North Korea since 2016. Nuclear armed countries with first-use/first-strike weapons and war plans include the US, Russia, the UK, France, Israel, and Pakistan. The Trump administration has repealed a 2008 prohibition on the use of cluster munitions and declared that it will again make combat use of them, in spite of a 2008 UN treaty ban that’s been ratified by 120 countries. Cluster munitions—rockets, bombs, missiles and artillery projectiles that scatter hundreds of smaller exploding bomblets over wide areas—were outlawed by the treaty because they indiscriminately maim civilians, and because unexploded bomblets in war zones around the world have killed or wounded civilians many years after the conflict has ended. The 2008 US prohibition was compromised, and in 2009 Cluster bombs in Cruise missiles were used by the Navy in an attack inside Yemen that Amnesty International reported killed 41 people, including 14 women and 21 children. The Pentagon keeps more than 1.5 million of the older munitions (containing over 90 million bomblets) in South Korea, where they imply readiness for war against North Korea, and another 2.2 million in the United States. If you were thinking that protest and resistance against the Bomb will be easier in the United States now that the United Nations General Assembly, on July 7, 2017, overwhelmingly approved a treaty outlawing the possession and threatened use of nuclear weapons (voting 122 to 1), think again. The nuns appealed, but in 2005, the 10th US Circuit Court of Appeals, also in Denver, upheld this all-encompassing exclusion of evidence from the jury. Matthew Lippman, Professor Emeriti of Law at the University of Illinois at Chicago, has argued that, “Civil resisters typically … claim that their criminal act was a justified attempt to halt an ongoing governmental illegality.”[vi] The government is, the resisters assert, “intentionally engaging in illegitimate criminal conduct” — nonchalantly called “deterrence” — which is the ongoing public, terroristic threat to commit massacres. Most of the trial court orders forbidding “necessity” defenses rely on the Chicago-based 7th Circuit’s 1985 decision in US v. Allen, which asserts, in error some would say, “Although their purpose may have been to uphold international law, their action disobeyed the wholly independent federal law protecting government property.” Although federal law may be independent, it is not superior to or controlling of US treaties which constitute “supreme law” under the US Constitution. The 7th Circuit’s error, or subterfuge, is obvious and egregious in view of five Supreme Court cases in which US treaty law is declared the “supreme” law of the land[vii], and controlling of all the rest. Prof. Lippman says, “By denying protesters the use of the necessity defense, courts merely are … abdicating their constitutional duty to permit criminal defendants to introduce a defense.” Nowadays, most federal juries are prohibited from learning objective facts from expert witnesses about nuclear weapons — either about their uncontrollable, indiscriminate, and long-term radiological effects, or about what superior/controlling law says regarding individual responsibility for the planning and preparation of massacres. Federal juries only hear what the prosecutor’s military or weapons-building witnesses (so-called “experts”) say in testimony about the Bomb. (Occasionally, federal defendants are allowed to testify about the facts, but their testimony is always dismissed an inexpert, and coming from potential saboteurs or terrorists.) The government witness’s biased, self-interested testimony and “exhibits” — from the perpetrators of the crime being protested — become the only set of “facts” the jury is allowed to consider. 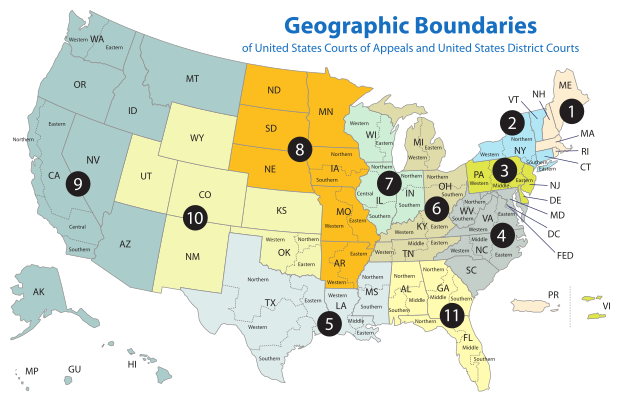 Map of the geographic boundaries of the various US Courts of Appeal and US District Courts. Because of court orders granting “motions in limine,” federal juries never hear any expert testimony (facts) that contest and even rebut or refute the military’s claims that nuclear weapons are defensive and legal. The reason for excluding these facts is obvious. Ordinary citizens, let alone legal scholars and weapons designers, can easily disprove the nearly axiomatic presumption that nuclear weapons are lawful. 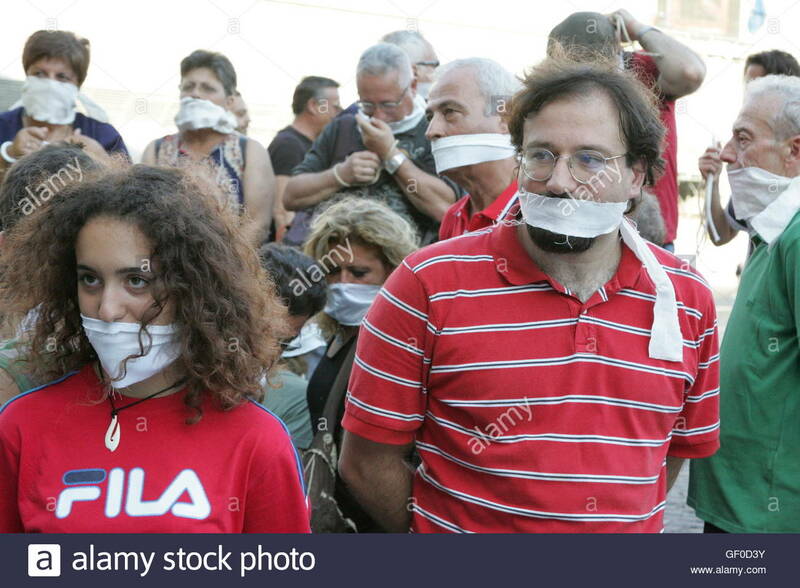 Judges at every level of the judiciary all know how easy it is to show that hydrogen bombs are ghastlier and more heinous that all other banned weapons (poison, cluster munitions, land mines, and gas) combined. This is my personal experience as well. In a simple Minneapolis, Minn. case of trespass against depleted uranium munitions manufacturer Alliant Techsystems, four civilian non-lawyers, myself included, proved to a jury in 2004 that our refusal to leave the company’s premises was an act of justifiable crime-prevention, not criminal trespass. The jury found us not guilty. It is so easy to show that radiological weapons are unlawful — to manufacture, possess or to use — that we established our successful defense of necessity without the help of attorneys. Binding international treaties in general,[viii] and US Air Force, Navy and Army Field Manuals in particular, all hint at the legality of nuclear weapons by forbidding mass attacks on civilians. In view of the poisonous, indiscriminate, long-term and uncontrollable effects of nuclear weapons, military and international treaty law can be interpreted as having already prohibited them, like other contraband, in a class along with land mines, cluster bombs, biological weapons, and poison gas. Yet federal courts cannot tolerate any airing of these facts — which might prove the Bomb is unlawful — and the “supreme” law can’t be allowed within a jury’s earshot. To protect the bomb from legal scrutiny, federal judges have created a legal vacuum, where the introduction of even the tiniest bit of fresh, treaty air would smash their bubble. The courts are so afraid of any expert identification of the Bomb’s unlawful status that in one fantastic case, after a federal judge in Arizona agreed to hear a necessity defense by nuclear weapons protesters, the 9th US Circuit Court of Appeals in San Francisco rushed in before trial to prevent it. Arizona’s US Attorney filed a complaint against the trial judge, in US v. the Hon. Richard M. Bilby[ix], in which he warned that the defense of necessity would, “divert the focus of the trial,”[x]… “transforming routine criminal prosecutions … [in] to broad-ranging and time-consuming inquiries concerning the wisdom of nuclear … policies…”[xi] Indeed, “If left uncorrected, the … order will … possibly result in the defendants’ acquittal…”[xii] — a frightening prospect indeed, that the 9th Circuit quickly stifled. —John LaForge is the senior staffer at Nukewatch, a nuclear watchdog and antiwar group in Wisconsin. This article was originally published in The Nuclear Resister. [i] The Tenth Circuit, US v. Platte, Hudson, Gilbert (2005); Seventh Circuit, US v. Urfer, Sprong, 287 F.3d 663 (2002), and US v. Haynes, 143 F.3d 1089 (1998); First Circuit, US v. Maxwell, 254 F.3d 21 (2001); Ninth Circuit, US v. Komisaruk, 885 F.2d 490 (1989), and US v. May, 622 F.2d 1000 (1980); Eighth Circuit, US v. Kabat, 797 F.2d 580 (1986); Eleventh Circuit, US v. Montgomery, 772 F.2d 733 (1985); and the Second Circuit, US v. Allen, 760 F.2d 447 (1985). [ii] 2nd Circuit, US v. Allen, 1985. [iii] 7th Circuit, US v. Urfer & Sprong, 2002. [viii] The Hague Conventions ban the use of poison or poisoned weapons; the Geneva Gas Protocol prohibits gas weapons “and all analogous liquids, materials or devices”; the 1977 Protocol Additional to the Geneva Conventions outlaws weapons that do long-term damage to the environment; the Geneva Conventions forbid indiscriminate attacks, attacks on civilian objects, and reprisals. [x] Prof. Matthew Lippman, “Towards a Recognition of the Necessity Defense for Political Protesters,” Washington and Lee Law Review, Vol. 48, No. 1, Winter 1991, p. 21.